US power/progressive metallers BRUTAL HAND returned with the 3rd opus! Played with superb technical skills, their music is thick and intense, burning with rage and passion, but now even more in your face. With a powerhouse of a vocalist at the helm, inspired solos, thundering rhythms and haunting melodies, enhanced by keyboards, they've created a crushingly heavy and dark album. Fans of SAVATAGE, WARRIOR, SHOK PARIS, DREAM THEATER, VENI DOMINE, METAL CHURCH, VICIOUS RUMORS and TONY MARTIN take heed 'cause BRUTAL HAND are ready to take the metal world by storm! BRUTAL HAND was originally founded by two brothers, guitarist Ed and drummer Jimmy Herrera as a cover band called MINDS EYE. 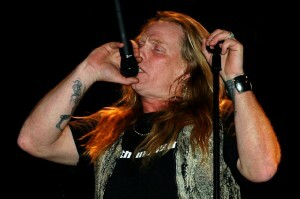 In October 2000 the line-up was complete with the addition of the vocalist Brad Bowles, bassist Joe Hendricks and keyboard player Doug Collier. 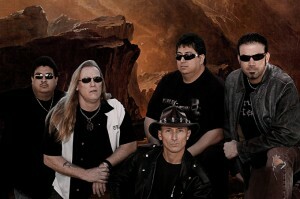 The band experienced a successful run as a cover band tackling the more technical songs from bands such as DREAM THEATER and RUSH. In the summer of 2002 BRUTAL HAND decided to concentrate on writing their original material. With 2 already under their belts ("The Hour" and "Focus"), they started hammering out the tracks for their first CD. They all kicked around a million band names, wrote a dozen tunes, and in the summer of 2003 began recording their self titled debut release "Brutal Hand". The 12 tracks were all recorded and mixed in their rehearsal studio. The CD was released in the summer of 2004 to an eager welcoming crowd at the band's release party in Tower Records Denver, Colorado which was a glaring success. The employees at Tower Records, Cherry Creek were blown away by the fan turn out. According to the band's sources at Tower, BRUTAL HAND broke, and still hold the record for attendance previously held by the Blues Brothers for a single night release. They also broke the record for the most CDs sold under a six month consignment contract. And they finished the month of June as the 1st seller for the Cherry Creek store, beating out all the national major label artists. Since June 2004 BRUTAL HAND have been playing a plenty, building a loyal following outside of their own immediate family and friends. Their CD has made it into the hands of tons of fans worldwide. The reviews have been incredible in America and in many countries in Europe, due to true diversity of the songs contained on the album; there is something for all kinds of hard rock and metal fans alike. The typical comparisons are to SAVATAGE, QUEENSRYCHE, DREAM THEATER etc., which are indeed the band's major influences, so that would classify them as a US Power/Progressive Metal band. After releasing their debut album, BRUTAL HAND were forced to find a new lead vocalist as Brad had left the band to raise a family. As it turned out, this has been only to their advantage. Finding Freddy Ferrell in 2006 has been a blessing for the band and their sound. They entered the Rocky Mountain Recorders studio in July 2006 and released their second full length, "Unchain The World" in October 2006. The new album received even more rave reviews from all over the world and one of the songs, "Out Of Time" was voted and featured on the Vol. XIV of the bi-annual compilation "Metal Crusade", coming with one of the biggest German magazines, "Heavy", in June 2007. In the fall of 2008 BRUTAL HAND have reached the midway point of writing their upcoming 3rd album. 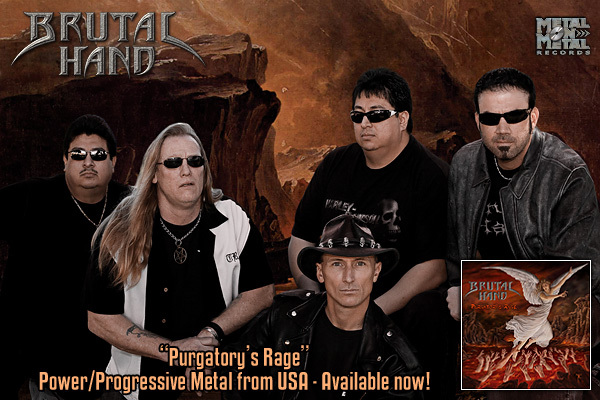 The third opus of BRUTAL HAND, "Purgatory's Rage" shook the metal world in December 2009. Their music is thick and intense, with strong and expressive vocals, inspired solos, thundering rhythms and haunting melodies, enhanced by keyboards creating dark and heavy atmosphere. Full of superb technical skills, their new album hits you in the face right out of the gate and does not let up!